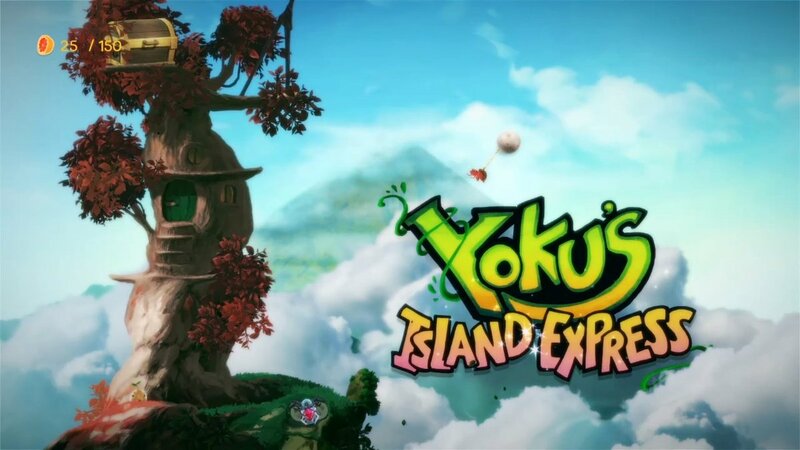 Yoku’s Island Express is a multi-platform release from developer Villa Gorilla and publisher Team17 Digital LTD. There isn’t much in terms of backstory for the game except that it was made by a small team in Stockholm Sweden. As for the story of the actual game, there is a quite a bit to it. Like any self-respecting dung beetle of age, going out and getting a job is the number one priority. Yoku’s Island Express starts you off washing ashore on your way to Mokumanu. Upon arrival, you are greeted by a Posterodactyl who’s giving up his badge and delivery ways on the island for another life. As a dung beetle, simple named Beetle, you take up the mantle and begin to uncover a mystery plaguing the islands life force. Throughout the 5-6 hour story campaign, you will find yourself on various degrees of fetch quest, delivery missions, squeezing fruit, helping villagers reach the peak of a snow-covered mountain and more. The way you traverse throughout the region though is unique. Yoku’s Island Express sets out to do something very different from the onset of the game. First off this shouldn’t be a surprise that you play as a carrier of sorts to a rolling piece of dung, I suppose, that is the games main pinball mechanic. Throughout the world, there are obstacles and pinball tables placed along your path that will require you to make precise hits with the flippers sometimes unlocking a door or defeating a gargantuan boss. While you move around the island more paths will open up as you use the fruit currency to unlock more flippers, remove Scootlings forming a roadblock, and discover new items, like a string, to help latch you on to flowers. There are a ton of collectibles and unlockables in the game. Some of these unlockables are merely cosmetic and will change the color of the ball you’re rolling. Other things you will find during your quest can help you reach higher heights or deeper depths. One of my favorite unlockables in the game is a fish suit that your beetle will wear to help him dive deeper into the caves of Mokumanu Island. The suit is a later game unlockable, but once you have it there is a new incentive to go back and discover some of what you couldn’t reach before. The game’s story does have a ‘go find these three things’ mechanic that reminded me of Ocarina of Time’s three gems you had to find to unlock the Master Sword. Overall I didn’t feel like the quests took me out of the game’s story but immersed me more into wanting to see what was hidden in the next section of the clouded ‘fog of war’ over the island. When it comes to music, Yoku’s Island Express has some of the coolest music in an Indie game. Its tropical melodies and beats felt like something out of the Donkey Kong series. There were changes too in the music depending on if you were using the island’s fast travel system, the Beeline, or if you were in the depths of a cave where sound actually felt tempered and muffled. As for audio, Pinball games often either overdo things or completely miss the mark when it comes to letting you, the user know if they hit the right target. The subtle grunts of hitting a slug, or tapping the ball with the flipper sounded very natural and helped to keep me engrossed in the game. I never once felt a sound coming from a character or section of the world sounded off. I will say that Yoku’s Island Express out Animal Crossings, Animal Crossings. The characters you meet speak with a nonsensical gibberish that reminded me of Animal Crossings games but did it better as it never sounded annoying or loud over the other game audio. One thing I will bring up, is a boss fight. The creature’s shrieks actually game me chills, as I slowly edged out its health bar and defeated it. I could sense that my hitting it in the sweet spot actually hurt it…poor spider queen. I can’t say that I have had many ‘must-plays’ that I have had a chance to review this year, but Yoku’s Island is definitely on that list. While the game has a place on Windows, Xbox, PlayStation, Switch (and maybe some others), it truly fits in on the Switch and its handheld mode. I did notice some frame-rate dips, that while not game breaking, they sure slowed me down some. These game hiccups came during some Beeline fast travel as well as during a few multi-ball events. I thought at first it was because they want to slow the camera down to show me something that I needed to hit, but it turns out it happened when there was just too much going on in the game. Yoku’s Island is a greatest hits collection of pinball tables with unique characters and a charming story of saving an island one mailbox at a time.